An employee enters a room at Ledgeview Living Center, Aug. 9, 2018. Roger Wilday’s family ran the Ledgeview Living Center in West Paris for nearly five decades, first managing the nursing home on behalf of the Seventh-day Adventist Church and then buying the facility in 1988. Now, the building sits vacant. The family was forced to close the facility in late August, leaving about 85 residents and 120 employees to find new homes and jobs. Ledgeview was one of half a dozen nursing homes that shut down in Maine this year, uprooting roughly 200 elderly residents across the state and accelerating a trend of closures in rural towns. The difficult decision to shut Ledgeview’s doors came after years of escalating financial struggles, Wilday said. 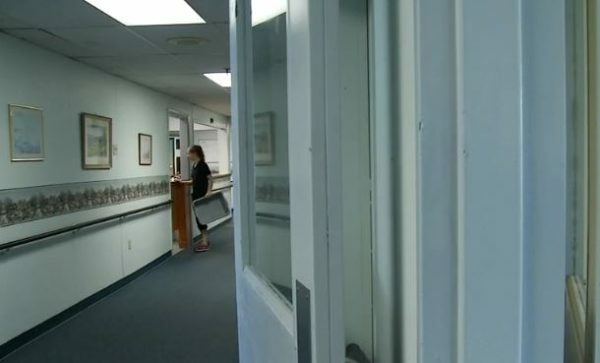 While all of the residents found beds at other facilities, some had to leave the community, including one who now lives north of Augusta, about an hour away. Wilday, who found work with another senior living company, still finds it hard to drive by his family’s former business on Bethel Road. A foreclosure sale is likely soon, he said. Years of pressures, from underfunding to struggles to recruit staff, have caught up with the facilities housing Maine’s oldest residents, leading not only to closures but to poorer care overall. That reality is beginning to emerge in federal data and is even acknowledged by the trade group that represents nursing homes in Maine. The personal toll of the closures on the elderly and their families is acute, said Trish Thorsen, program manager for the Maine Long-Term Care Ombudsman Program, which advocates for nursing home residents. Even giving up a coveted room with a window can feel like a significant loss, much less leaving the community where a resident is known and loved, she said. “That’s big for them, that’s their life,” Thorsen said. When a nursing home closes in Maine, its operators must coordinate with the Long-Term Care Ombudsman Program and the Maine Department of Health and Human Services to ensure that residents are safely transitioned to new living arrangements. Maine’s nursing homes have been fighting for survival since at least 2012. That year, the shuttering of a Calais nursing home reverberated throughout its Washington County community, with some residents forced to move an hour away to Lubec and almost 100 people left jobless. Maine lost three more nursing homes in 2014, and one each in 2016 and 2017, before the significant uptick this year. In 2018, six nursing homes closed in Jonesport, Patten, West Paris, Fryeburg, Bridgton and Freeport, according to the ombudsman program. Collectively, just over 200 people resided at those homes when each closure was announced. The Fryeburg, Bridgton and Freeport nursing homes belonged to the same family-run company, which sold them in November to another firm that converted them to residential care facilities. Some of the residents chose to remain at those homes after the transition, though it’s not clear how many, while others moved. Maine, the oldest state in the nation, is now home to 94 nursing homes. Since 1995, the state has lost nearly 40 of them. By 2030, nearly a third of Maine’s population is projected to be over age 65. Yet the state has fewer nursing home beds than other states, averaging 24 per 1,000 residents in the over-65 age group, said Richard Erb, president and CEO of the Maine Health Care Association, a trade group for long-term care providers. The national average is 36 beds. In every instance, the owners of the facilities that shuttered this year attempted to sell before closing, Erb said. MaineCare, the state’s Medicaid program, foots the bill for most — 66 percent — of Maine’s roughly 6,500 nursing home residents. At some homes, the health insurance program for low-income people covers nearly every resident, stretching bottom lines even further. But the program has underpaid nursing homes for years, according to nursing home operators. MaineCare bumped up payments in 2014 and again in 2015, preventing an “absolute catastrophe,” but nursing homes’ costs escalated more, Erb said. Reimbursement policies also tend to favor larger facilities with a greater volume of residents, he said. Now, Erb’s association is calling for another reexamination of MaineCare reimbursement policies. On average, a day of care in a nursing home costs roughly $250, he said. MaineCare pays only about $215 on average. Some facilities stay afloat by shifting the burden to residents with more generous private long-term care insurance or Medicare, which only pays for some skilled rehabilitation services that must be delivered by nurses or therapists with certain qualifications. But that’s not always an option, particularly in rural areas where residents who can afford better insurance are few and far between. Nursing homes are struggling to pay staff, resulting from a shortage of qualified workers who have leverage to demand higher salaries, and the minimum wage increase that took effect in January, Erb said. Certified nursing assistants are the “backbone of the workforce,” but it’s challenging to recruit them when they can find less demanding jobs in retail or other industries for comparable pay, he said. “It’s a difficult job both physically and emotionally,” he said. When nursing homes can’t attract enough staff themselves, increasingly they turn to staffing agencies, which charge significantly more than the homes pay, Erb said. That not only increases the homes’ costs but also means many staffers are working on a temporary basis, sacrificing consistency in residents’ care. The staffing crunch has affected the quality of care that nursing homes in Maine provide, Erb acknowledged. Earlier this year, four Maine nursing homes received the lowest possible score for staffing levels, according to an analysis of federal data by Kaiser Health News. Two of them, in Fryeburg and Bridgton, were among the half dozen that later closed in 2018. In December, the federal government announced it would cut payments to nursing homes whose patients wind up in the hospital repeatedly. In Maine, nearly 70 percent of the 100 nursing homes that provide skilled nursing care were penalized. About 30 percent earned bonuses. That showing was roughly in line with national averages. Still, Maine facilities have among the lowest rates in the nation for serious deficiencies and average fines imposed by regulators, according to Nursing Home Inspect, a project of the nonprofit investigative journalism organization ProPublica. Deficiencies can include mistreating patients or high infection rates. All six nursing homes that closed in Maine this year had empty beds when they shut down. Many in rural areas, where Maine’s aging population is at its oldest, are counterintuitively operating at less than full occupancy. That’s partly because fewer people are entering nursing homes in the first place, said Brenda Gallant, executive director of the Maine Long-Term Care Ombudsman Program. The state has placed greater emphasis in recent years on caring for seniors in their own homes, she said. Many who do move out of their homes choose to remain in residential care facilities even after they qualify for more intensive nursing home care, she said. Another factor contributing to closures is uneven Medicare reimbursement for skilled rehabilitation care, Gallant said. Nursing homes closer to hospitals miss out on those higher payments, she said, because patients just get their rehab at the hospital before they’re discharged, rather than at a nearby nursing home.